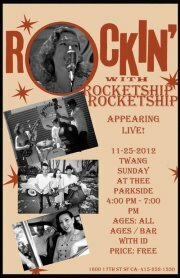 LIVE BROADCAST FROM THEE PARKSIDE w RSRS and MAD MAMA!! If it went down smooth it wouldn't be CHEAP HOOCH!! This is what pirate radio is all about, despite the inevitable tech flubs, we bring you one of our best. Listen in as we stream a live set from Rocketship Rocketship and have a rockin' ukulele sing-a-long with Mad Mama and the entire audience at Thee Fabulous Parkside!! Just one of those San Francisco Sundays we all rave about. and my awesome co-host D$! !